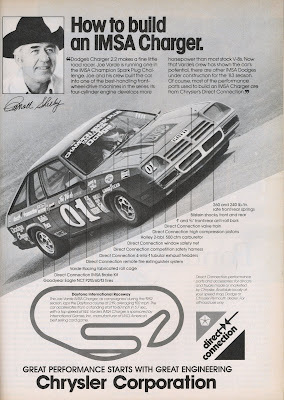 A year before Carroll Shelby lent his name to Chargers and Omnis he was already showing up in advertisements. Although Carroll doesn't claim to prepare or race Joe Varde's IMSA charger he does have a favorable opinion. Joe was able to find more success with Shelby Chargers in '83.